Excellent design: the Stelton Knife Series Pure Black and the additional Pure White Magnetic Strip are part of the spring 2011 masters. 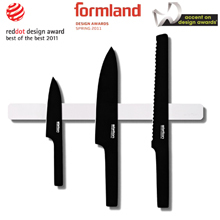 Three desired design awards as a total were given to Pure Black and White, amongst them also the “Red Dot Design Award Best of the Best”. The third and maybe most exclusive design award in the league is the desired “Red Dot Design Award: Best of the Best. This one is only given to exceptional products within the awarding of the Red Dot Design Award in July, and it prices designs with the highest design quality. Accordingly exquisite is the winners list: only 1.3 percent of the submitted products were honoured with a “Red Dot Design Award: Best of the Best” in the year 2011.